There is one indoor tennis court and one outdoor Tennis Court at Hayne Barn. 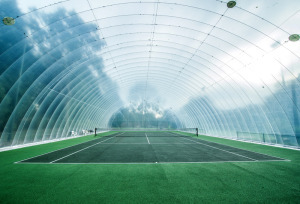 To book the courts please contact us on 01303 265 552 or email info@haynebarnindoortennis.co.uk. Court time is payable on the day between 08:00 – 17:00 Mon – Fri at the office or contact us if you would like to discuss an alternative payment method. There is a 72 hour cancellation policy for pre booked courts, after this we reserve the right to ask for the full amount. Block bookings are available to members only and can be requested through the Hayne Barn office. Payment must be in advance for a minimum of 4 weeks and a maximum of 12 weeks. Hayne Barn reserves the right to keep set times for coaching and tournaments and will give block bookings as much warning as possible if it will affect their booking. We look forward to seeing you at Hayne Barn Tennis Courts and hope you have a great game.